It felt weird to be back in Glasgow after the longest time I had been away for ages. And then to be acting as tour guide to a bunch of people who’d never been to the city before. We went to Mono (a bar and record shop favoured by the indie set) to meet up with a crowd who were going to the gig and eventually got served lunch (it’s all very well having bar staffed by people who are in bands but as waiters they make great musicians). A few of us then went to check out the venue. There was a very small queue on each side at about 2.30pm. As a couple of us had to wait for the box office to open, we went and had desserts in West (the microbrewery beside the Templeton’s Carpet Factory). When we went back around to the front entrance about 4pm it had started to rain. I sorted out my tickets (thanks nice box office lady for letting me leave the spares ones for my friends to collect) and then tried to raise someone on the phone for the last spare I had available. But no one was picking up. I decided that if I was going to stand around getting wet I might as well do it inside the venue and get a decent spot. My compardres had stationed themselves fairly near the stage and bought plastic ponchos (not very eco-friendly but unfortunately necessary as the W.A.S.T.E. cagoules are no match for the Glasgow drizzle. I put one on over my existing rain coat and glooped about like a giant see-though jellyfish. We settled in with a few drinks and the time passed until Bat For Lashes came on stage. Some of my Scottish friends managed to find us in the crowd just before the bands started, the whole approach to where to stand is different in Glasgow. Your typical audience member has no truck with queuing in the rain, they’d rather be in the pub. So for most of the show there was a surge of people all trying to get to the front or start a mosh pit and quite a bit of argy bargy. We were in a fairly safe position two rows back, quite far to Jonny’s side (similar to where I’d been on the second night in London) but if not actually on the barrier it takes all your strength to stay upright and keep a view of the stage. I was pretty tired, several boardies had kipped at my flat and it is difficult to have an early night with a house full of eager people who are excitedly catching up with each other. I was hanging on, convincing myself that if this was going to be the last show for me on this tour then I’d better get the most out of it. The pit got more and more energetic but each time we thought they might be about to play a slower track they hit us with another fast one. 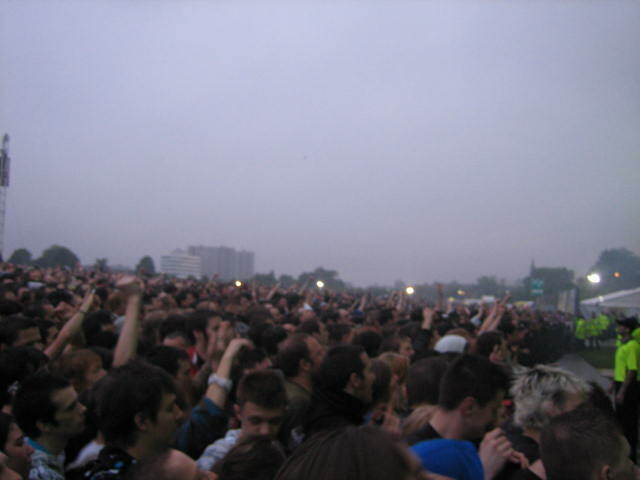 My friends got further and further away from me, some pulled into by the mosh to the front, some having to retreat further back and some staying to battle it out for their places. I had a few Incredible Hulk moments where I found the strength to keep my feet firmly planted, even to dance when there were elbows coming from all sides (I suppose I should be more forgiving to the chap in front, he was really into it moving all over the shop. I suppose that’s what it’s like to get stuck behind me, “dances with motion blur” at a show). As well as a really frantic set (Thom really throwing himself into his Myxomatosis dance!) we got another audience participation version of Karma Police and an encore treat of Like Spinning Plates. All in all, despite or possibly because of the rain, a really good show to end on for me. I waded out, back to see everyone who by now knew to meet me at the sound desk after the end of the show. Then there was a weird few minutes when the security herded the chosen few with wristbands from one side of the field to the other, like some sort of One Man And His Dog tournament without the animals. Eventually a security guy swore that he wasn’t kidding and Gabi and I went to the right gate for the catering tent. They herded us about a bit more and finally we reached the obligatory last few beers and a seat giving us a chance to regroup and recover a bit. My tour ended here, a lot of the others went on to Manchester and to Amsterdam but I had no fuel left in the tank. It remained to catch up on the videos, to sleep and to wait for the inevitable come down.